is used for gluing of extremely stressed joints. It glues for example leather, rubber, textile and different materials from hard plastics, metal or wood. 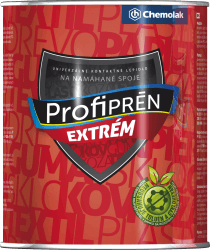 Profi pren Extrem is resistant to water, its application is easy and fast. The adhesive is not suitable for gluing of expanded polystyrene, plasticized PVC and leatherette.